TULSA — Tulsa police, Oklahoma Highway Patrol and Catoosa police likely saved the life of a woman after a high-speed chase Friday morning. Catoosa Police Officer Brent Colbert said their department responded to a burglary call early Friday morning. He said when officers arrived, a woman said she did not want them on her property. They did not know she was being held at knifepoint by Garrett Estes inside. Officer Colbert said there were three total people inside the home. One was able to escape later in the morning and call 911. 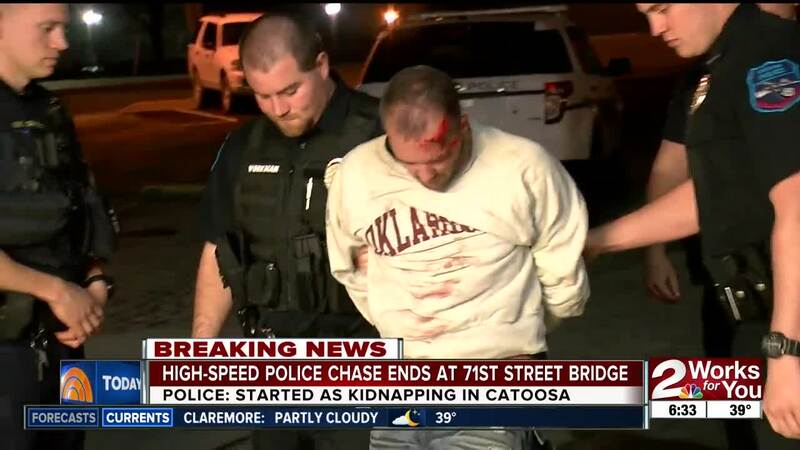 When Catoosa PD arrived, Officer Colbert said they saw a white car leaving the home and that is when the chase began. One of the female victims was inside the car throughout the chase. Officers later learned the car he used in the pursuit was stolen from the victim. The victim and suspect did not know one another, according to police. Tulsa Police Caption Malcolm Wightman said they got involved around 4 a.m. when Catoosa police notified them they were in pursuit of a suspect. Capt. Wightman said Estes led them through Tulsa and ended up getting stopped by OHP Troopers. They were able to use a maneuver to stop the car Este was driving and it rolled over. Officers tried for five to ten minutes, according to Capt. Wightman, to convince Estes to come out of the car. He said they were unsuccessful and eventually had to deploy pepper balls and tasers. "We are not really sure what his plan was, but we think it is very likely that we may have saved a life," Wightman said. Estes was arrested and taken into custody by Catoosa police. He is charged with three counts of kidnapping, three counts of assault with a deadly weapon, first degree burglary, larceny of a vehicle, felony eluding and several traffic violations. The victim was treated by medics for non-serious injuries. Court records show Estes pleaded guilty in 2016 to kidnapping a woman with a protective order against him in Mayes County four years earlier. He also pleaded guilty to an assault and battery charge in Tulsa in 2015. Court documents show he punched a loss prevention employee of Hobby Lobby after trying to return stolen merchandise for a giftcard.